and here’s the original version. There currently are six themed areas and they are International Street (entrance/exit), Old Virginia, Candy Apple Grove, Safari Village, Planet Snoopy, and Water Works. First, we’ll start our trip by walking through the gates and entering International Street. This is the first area you enter after you come through the gates. Directly in front of you is a long rectangular pool with large fountains in it with shops on either side and a large 1/3 scale Eiffel Tower at the end. This is what the original area was when it opened. Since then, International Street was expanded to include the Action Theater which was opened in 1993. It’s a 3-D theater that has hosted a number of different films including Days of Thunder from 1993-1997 based on Paramount’s hit movie of the same name based on NASCAR, to SpongeBob Squarepants 3-D from 2003-2011, a popular cartoon from Nickelodeon, to the current offering called Dinosaurs: Giants of Patagonia 3-D. The other rides included in the area are the Berserker, a Looping Starship ride from Intamin that was installed here in 1984, and a roller coaster called Dominator. Here’s an off ride video of the Beserker thanks to CoasterForce on YouTube. Dominator was originally built at the former Six Flags Ohio park in Aurora, Ohio, USA on May 5, 2000 and ran under the name Batman: Knight Flight. The park was eventually sold to Cedar Fair which currently owns this park as well as a number of other parks in the US and Canada. The then changed the name of the park back to Geauga Lake and the name of this coaster to Dominator. The park closed in 2007 and it was moved to Kings’ Dominion along with the Americana Ferris Wheel and El Dorado which no longer runs at the park. Dominator is a floorless coaster which means it runs above the track but has no floor and it’s one of the best floorless coasters I’ve ever been on. Dominator has the fourth tallest vertical loop in the world standing at 135 feet tall. Only Viper at Six Flags Magic Mountain at 144 feet tall, Superman: Krypton Coaster at 145 feet, and Full Throttle at Six Flags Magic Mountain at 160 feet have taller loops. Dominator is the worlds tallest, fastest, and longest floorless coaster at 157 feet tall, 4,210 feet long, and a top speed of 67 mph. It also has five inversions. Here is an off ride view of Dominator. Now we turn right at the Eiffel Tower and head into our next area. This section is one of the two original sections to keep its original name. It has a total of four rides, one roller coaster, a theater, and two up charge attractions (extra pay). The four rides include the Blue Ridge Tollway which was built here in 1975 and is a family car ride that everyone can ride on. It is a car ride that utilizes a center guide rail to steer the cars through the course. Another ride is the White Water Canyon which opened here as the White Water Rafting Adventure from Intamin that opened here in 1983. This ride will get you soaked so don’t ride if you want to get wet. Here’s another ride that will only get you wet a little bit. It’s a log flume that was built by Arrow Dynamics and I couldn’t find out when it opened here. In the video you’ll see a line of people on a boardwalk, they’re waiting for the White Water Canyon rafting ride. Next is a true amusement park classic made by a company that is still around to this day. This ride is a Flying Scooter model and was manufactured by the Bisch Rocco Company. They are the original company that came up with this kind of ride idea back in the first golden age of amusement parks in the 1930’s and 40’s. You can control how high you go by simply moving the rudder in front of you to the left or right. This ride really is quite fun and just about anyone can ride it as well. The next two are the up charge attractions which requires an extra fee to experience them. First off is the Thunder Raceway which is a standard go-kart track that opened here in 1995. The next one is a walk-through attraction. This attraction was built by Dinosaurs Unearthed in 2012. You basically pay extra to walk down a path and push buttons near each dinosaur to have their arms, tail, head, and body move and make sounds. I’ve never experienced this so I couldn’t say if it is worth the extra cost. The video is courtesy of Behindthethrills.com on YouTube. The next one is a classic wooden roller coaster. This wooden roller coaster was one of the last coasters to be built by the Philadelphia Toboggan & Coasters company. It was designed after the Coney Island Wildcat near Cincinnati, Ohio, USA. It really is a decent wooden coaster despite sounds on the turns which seem to be ear-splitting in the video but really not that bad in reality. It opened here in 1982 and is 3,150 feet in length and is 87 feet tall with a ride duration of about two and a half minutes long. The only other attraction in this area is the Kings’ Dominion Theater which was originally called the Mason Dixon Music Hall and it hasn’t been used in some time. Next we journey on into the parks largest area. This area is the largest area in the park and was originally called Coney Island when the park opened in 1975. It was later changed to Candy Apple Grove in 1976 until 2000 when it was changed to the Grove. At the point, it lost quite a bit of its theming and rides and remained that way until 2013 when it reverted to Candy Apple Grove. This area was where the original Singing Mushrooms were. There are seven rides, four coasters, several arcade games, and fast food restaurants. Now we’re off to our first ride and it’s a nice ride for the whole family. I believe this is a Century Wheel from Chance Rides but I’m not real sure about that, in any case, it’s a nice large Ferris Wheel and a good way to rest your weary feet while taking in the sights and sounds of the park. The video below is a short off ride view of Americana’s light package on the wheel itself courtesy of LakeCharlesGuy on YouTube. Now we go to another classic ride. This carousel model number is #44 and was originally built in 1917 by the Philadelphia Toboggan & Co (PTC) for Riverside Park in Springfield, Massachusetts, USA where it operated until 1938. It was then moved to Roger Williams Park that same year where it operated until 1973 when it was moved here and completely restored for opening day in 1975. I’ve been told that there were multiple layers of paint and that pieces were falling off once the paint was removed. There are 50 jumping horses, 16 standing horses, and 2 chariots. There is a Gavioli band organ but it isn’t being used, recorded band organ music is being played over the speakers instead. It’s a real shame that the organ isn’t being used as hearing a real band organ play music is so much better than hearing a recording of one playing. The next ride is a real SCREAMER! This was once the worlds tallest drop towers when it opened in 2003. It’s a Gyro Drop tower from Intamin which means it rotates as it goes up the 301 foot tall tower. Once it reaches the top, the rotation stops, and the ride drops to the ground at 72 mph. I rode this quite a few times while I was there and I loved it every time. Our next ride is another tower ride but a completely different ride experience. This ride is 301 feet tall but is not a drop tower. It’s an extreme swing ride from Mondial and it opened here in 2012. The ride is set to music that seems to evoke a feeling of soaring while on the ride. I’ve heard Jupiter from Modest Mussorgsky’s The Planets, themes from ET the Extra Terrestrial, Star Trek, Superman and many others. This ride came after my last visit so the video is courtesy of Sharp Productions on YouTube. I have been on the carbon copies at Carowinds and Cedar Point and they are really fun rides but not for those that are afraid of extreme heights. Our next four rides are standard amusement park rides for which I have no videos of so I’ll give you a brief description of them here. The Dodgem is a standard large bumper car ride that has been here since opening day. Waveswinger is a swing ride with individual seats suspended from the roof above via chains. It’s from Zierer and rotates around a center post lifting riders in a wave from up to 30 feet high and has been here since 1975. The Bad Apple is a Troika model from HUSS and was installed here in 2002. It originally was called the Triple Spin from 2002-2013. The last one is an up-charge attraction (extra pay) called the Xtreme Skyflyer. This ride is a dual swing Skycoaster model from the company of the same name. This one is 153 feet tall and riders are strapped into special full body harnesses and then hooked up to two guide wires. They’re then pulled up the back spike and the riders then pull the rip cord once at the top and they swing back and forth until they are able to grab an arresting ring that brings them to a stop. Now on to the coasters. This is a triple out n’ back wooden roller coaster from International Coasters, Inc that opened here on April 28, 1994. What makes it a triple out n’ back coaster? Well a standard out n’ back coaster goes out to a point then turns around and comes back, a double out n’ back does the same thing. However, on the return trip, it turns around, goes back out again, turns around at the far point, and then returns to the station. A triple out n’ back does this trip three times. This coaster was built by a company that only built two coasters, the other one is a carbon copy of this one with the same name at Carowinds, a sister park owned to this one. It is 83 feet high, 3,157 feet long, has a top speed of approximately 50 mph, and a total ride time of about two minutes. This coaster is a bit rough for wooden coasters so I do recommend you ride in the front row as I find it to be a tolerable ride in the front row. The farther away you sit from the front row, the rougher the ride gets. The ride was so rough at one time that they had to install a trim brake at the bottom of the first drop to slow the trains down a little bit. Don’t worry, you won’t get thrown into the person in front of you as it is just meant to slow the trains down and not bring them to a stop. It’s like slowing down a little bit in a car to go over a rough railroad crossing. Here’s an off ride video I took while I was at the park in 2009. It should be noted that this ride was themed to being on the set of the Wayne’s World movie. The station had three segments to it, one was themed to Wayne’s basement, I’m not shure what the other two segments were but they were all part of the Wayne’s World set. The next coaster will leave you screaming. This is actually a racing roller coaster with an out n’ back design meaning that the two roller coasters race each other to the far end turnaround point and then race each other back to the station. This coaster has a significant history as well as it was featured prominently in the 1977 movie called Rollercoaster. To help promote the movie, the coaster was selected for a world championship roller coaster marathon that began on June 6, 1977. Among those that participated were Roy Brashears, Paul Greenwald, and Richard Munch who discussed forming a national club for roller coaster enthusiasts. That discussion led to the formation of ACE (American Coaster Enthusiast) in June of 1978 which is now a world-wide enthusiast club. Go to ACEonline.org if you want to join them or go online to look for a coaster club that is more towards your liking. I myself am a member of the Florida Coaster Club (FLCC) and you can find them at Floridacoasterclub.com. This coaster was built by Philadelphia Toboggan Co., designed by the famous John Allen, and opened on May 3, 1975. Both north and south sides have the same dimensions at 85 feet tall, 3,368 feet long, a top speed of 56 mph, and a total ride time of about two minutes and fifteen seconds long. Thanks go to Sharp Productions on YouTube for providing the on ride video. It should be noted that this coaster ran with one train facing backwards from 1992 to 2007. The experience was very unique and not as rough as you think it would have been. It should be noted that ACE awarded this coaster a Landmark status in June 2003. Our next coaster is full of quick turns and sudden drops. This coaster is a Wild Mouse coaster from Mack Rides which opened here on March 23, 2002. a Wild Mouse coaster is a small, family friendly coaster that uses single four person cars to go around quick turns ranging from 90 to 180 degrees and sudden drops at a relatively slow speed compared to the other major coasters. Ride with your hands up on this one if you dare but brace yourself for those sudden turns or you may find yourself in the lap of the rider next to you. This coaster is 1,312 feet long, is 51 feet tall, and has a top speed of approximately 35 mph. Here’s an off ride video I shot while I was at the park. Our next coaster has a bit of a “Shock” to it so I hope you can “stand up” to it. This is a stand up roller coaster from TOGO that opened here in 1986, that’s right, you ride this coaster standing up. It is one of the few coasters from TOGO that is still operating in North America, the other is operating a Canada’s Wonderland about 30 miles north of Toronto. This coaster is rough especially in the back half of the ride so I recommend riding as close to the front as possible. I myself rode it once in the front just for the experience and the credit and I can say TOGOs reputation is well-earned. There is one inversion on this coaster which is pretty smooth, the roughness comes in the small bunny hop hills on the back half of the coaster track. It is 95 feet high, is 2,231 feet long, has a top speed of about 50 mph, and a ride time of about two minutes. Here’s an off ride video I shot while at the park. You’ll have an adventure in our next area. This area has a African theme as this is where the Lion Country Safari monorail ride used to be until it was closed in the 1990’s. This area used to be called the Congo until the early 2000’s, it has a decent indoor counter service restaurant, a few gift shops, six roller coasters, and two flat rides. Let’s start off with the two flat rides. The first is a standard Scrambler ride from the Eli Bridge Co which was installed in 2000. The second is a bit more interesting. This ride was formerly called Tomb Raider: Firefall from 2005-2007. It is a floorless Top Spin model from HUSS that still retains all the theme elements from the Tomb Raider theme, including the water and fire elements. It really is an incredible experience, especially at night. The ride was installed here in 2005 and really does get quite a crowd at night. You’ll have to watch my off ride video to see just what it is like. Watch the whole thing as this is a day and night video. Next is a coaster I’m sure you’ll have a “blast’ on. This coaster actually replaced two water rides called the Lost World and Smurf Mountain which were there since opening day (I believe). Here’s a short video of what Smurf Mountain was like thanks to Jason Hart on YouTube. The ride system was somewhat similar to what the It’s a Small World rides are at the Disney parks in that it is a boat ride through several scenes with audio animatronics and no drop at the end. The Lost World was a log flume that was on top of the Smurf Mountain attraction with a drop at the end. Volcano: The Blast Coaster was the worlds’ first launched inverted roller coaster when it opened on August 3, 1998. It was built by Intamin and uses two launch zones that use Linear Induction Motors (LIM) to propel riders to a top speed of 70 mph so it can be launched out of the mouth of the volcano. 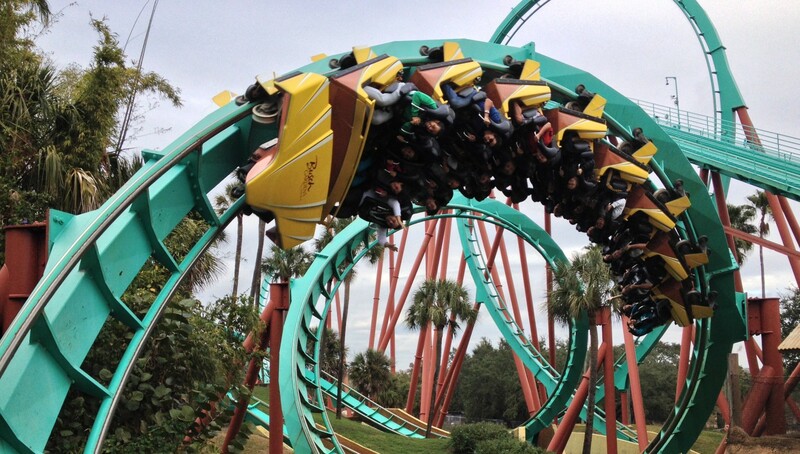 There are four inversions on this coaster that is 155 feet tall and 2,757 feet long. The first launch is just after the train leaves the station and the second is a speed boost that rockets riders out the top of the volcano. I recommend you ride front row and make a bee line right for this attraction as soon as the ropes drop opening the park for the day. This coaster routinely sees queues (lines) that get an hour or two long every day. Next is an indoor rollercoaster. This ride originally was called Outer Limits: Flight of Fear and it was themed to the then new Outer Limits TV show and it opened on June 18, 1996 at the same time with the other coaster of the same design at their sister park, Kings’ Island near Cincinnati, Ohio, USA. It was built by Premier and has four inversions, is approximately 74 feet high, is 2,705 feet long, has a top speed of 54 mph, and has a ride time of about two minutes and twenty-four seconds. Oh, did I mention riders are launched right out of the station and into a dark room with flashing lights and alien themed music. Unfortunately, I couldn’t take any off ride videos since this ride is enclosed and in the dark but I was able to find a video on YouTube from Marcus Dorsey that he filmed during Theme Park Reviews East Coast Bash but it only shows the launch and that’s it. and here’s Rob Alvey’s on ride video with commentary, I mostly agree with Rob except for one thing. I still think Millennium Force is a much better ride than this one. This coaster was built by Intamin and opened here on April 2, 2010. It is 305 feet tall, is 5,100 feet long, has a top speed of 90 mph, a ride duration of about three minutes, a first drop angle of 85 degrees, and is one of the few coasters that is pulled to the top not by a chain lift, but by a steel cable, much like an elevator. Now we’ll trek to the next coaster in this area that we’ve gathered out stomachs and bought the on ride photo and all the ride souvenirs you can handle. This coaster was built by Arrow Dynamics and opened on March 23, 1991 as the first roller coaster to go underwater via a 126 foot long tunnel. It has 2,700 feet of length, is 128 feet tall, has a drop of 144 feet, four inversions, at top speed of about 50 mph, and a total ride time of about one minute and fifty seconds long. Coasters from Arrow Dynamics do have a reputation for being rough but not too rough that it’s painful and this is no exception. I would recommend you ride in the front row especially for those of us that are taller than six feet as there’s plenty of leg room in the front row. Now we’re on to our next coaster. This coaster is called a Bobsled coaster which sounds exactly as you might think it is. It simulates the experience of riding a bobsled, unfortunately you don’t win any medals for having the best times of the day. It is the only operating Bobsled coaster from Mack Rides in North America. It opened here in 1988 and has a height of 69 feet, a total length of 3,200 feet, a top speed of about 41 mph, and a total ride time of about a minute and thirty seconds. Each train has individual cars that are painted to represent different countries that participate in the Winter Olympics. This launched roller coaster opened here as the Italian Job Turbo Coaster on May 27, 2006 at the same time as the two other coasters with the same name at Kings’ Island and Canada’s Wonderland, both sister parks to Kings’ Dominion. The name was changed to the current name in 2007. This coaster was built by Premier and was themed to the Italian Job movie which was pretty successful if I remember correctly. This one also has three launches and goes through several scenes that were in the movie. The rides top speed is 40 mph and has 1,960 feet of track, is 45 feet high, and a ride time of about one minute and four seconds long. Now it on to our last section, the kids area. This area was originally called Nickelodeon Splat City when it opened in 1996, it was then renamed Nickelodeon Central in 2000, and then re-themed to the Peanuts Gang and given the current name in 2010. there are 18 different rides just for kids in this area including Boo Blasters on Boo Hill which is an indoor dark ride from the Sally Corp. I really can’t go into too much detail about most of these rides as I just went through this area to a select few rides and then moved on, however I did shoot videos of two of the rides so I will describe them below. This is a smaller kids version of Windseeker from Chance Rides. It is a fun little ride in which you can slightly move your gondola from side to side by moving the rudders on either side to the left or right. This video may be blocked in your country so I do apologize if you’re unable to see it. Next is our last ride of our visit and it opened before the park officially opened to the public. This coaster actually opened in 1974 along with the Lion Country Safari which is now closed. It is a junior coaster that was built by Philadelphia Toboggan Co (PTC) and designed by the famous John Allen. The Ghoster Coaster originally was called Scooby Doo from 1974 to 1996, then it was called Scooby Doo’s Ghoster Coaster from 1997 to 2009 then Ghoster Coaster in 2010, then Ghoster Coaster from 2010 to 2013, then Woodstock Express from 2013 to the present. It’s 1,385 feet long, 35 feet tall, and has a top speed of 35 mph and as with all the rides in this area, almost everyone can ride this one. There is one more area called the Water Works which is included with the park admission, unfortunately I did not go in there as I’m really not a fan of water parks so I do apologize if you were looking forward to my review of that area. I do hope you enjoyed my review and videos and I do apologize about not taking any photos of this park. There is an outdoor kennel if you travel with your pet like I do but it is on a first come first serve basis and there is an additional charge per day. You’ll need to come walk and feed you pet as they will not do that for you and there are no overnight pet accommodations available. Please go to the parks website at Kingsdominion.com for ticket prices, operation times and dates, and any other questions you might have. Thanks for finally writing about >Kings Dominion | ThemeParkFanatic <Liked it!